Does ‘radical economic transformation’ include closing the gender pay gap? Last week Friday, the Norwegian Football Association announced that their men’s national team will be taking a wage cut in order for their female counterparts to earn the same. This will come into effect in 2018 and has been widely lauded as a step towards true equality. Currently, the women’s team is collectively paid 3.1-million kroner which is less than half of the 6.55-million earned by the men’s team. This is a groundbreaking step by Norway and we should heap praise on this generation of soccer players for setting an example. Of course, there is still a long way to go as we need to see such action across all sectors and industries. This gesture coaxed me into looking at our own backyard to see how we compare. After all we are South Africa: we have the most progressive Constitution in the world which promotes equality and social justice. It therefore follows that we should be the benchmark for the rest of the planet when it comes to matters of social reforms and confronting discriminatory systems, right? Wrong. We are not even close. The gender pay gap in South African sports is on the rise and there are few attempts to address this. In a written reply to parliament in 2014, the department of sports revealed some startling facts about pay inequality. It came to light that our national women’s team Banyana Banyana earns between R2 000 to R5 000 per game while players for Bafana Bafana take home R60 000 for a win and R30 000 for a draw. The injustice doesn’t end there as there are no women in a list of the highest earning players in the ABSA Premier Soccer League (PSL). Itumeleng Khune is currently the highest earner at a monthly wage of R480 000 followed by Teko Modise who earns R450 000. To be clear, there is nothing wrong with how much these players rake in but there is everything wrong with the fact that female talent isn’t as rewarded. Consider this: Portia Modise is considered to be the greatest striker (male or female) our country has ever produced. She was the first African player of any gender to score 100 goals for their country and she has represented us in over 120 matches. One would expect such an accomplished player to sit on a fat pension after retirement but Modise has publicly spoken out about being broke when she hung her boots. This is a disgrace. There is this false but pervasive notion that women players are paid less because their matches don’t achieve good ratings on television. We need to dispel this myth: there is no correlation between how much players earn and viewership numbers. Players make money from how much their clubs are willing to spend on them and from endorsements or sponsorship. One of the real questions we should ask is why we don’t see more big brands throwing their weight behind our women players. Another myth is that women’s teams don’t compete as well as the men. The truth is that around the world, women’s soccer teams actually perform better than the men’s national teams. In our context for example, the lowest Banyana Banyana has been ranked is 74th in the world while Bafana Bafana’s worst was 94th. Our women’s team has recently moved up two positions on the FIFA rankings to 48th place while the men’s team dropped to 65th place this year. The point I am making is that if earnings were performance-based then women should be taking home more. There is simply no excuse to pay women less. 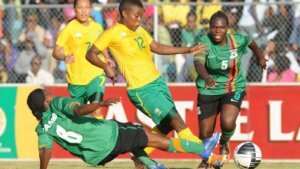 Modise has also lambasted the South African Football Association (SAFA) and how it has failed to support women’s soccer. Undoubtedly, this also relates to the earnings of female players who like male players depend on the game for their livelihood. Why is sport treated as a hobby when we talk about women players instead of looking at it as a profession? SAFA isn’t the only organisation failing sportswomen but our politicians and government need to carry some blame too. In 2016, the US Senate passed a resolution which mandated the US Soccer Federation to pay the women’s team the same as it does men. Will we ever see such action in our legislatures? As we approach the 2019 elections, the country faces a real possibility of electing a woman president in the form of Dr Nkosazana Dlamini-Zuma. She has spent much of her campaign trumpeting “radical economic transformation” but ironically, this has not included a conversation on equal pay for equal work for men and women. Instead of paying lip service to land reform and more recently a “funeral industry” reform, Dlamini-Zuma and all politicians need to demonstrate an awareness of how radical and transformative closing the gender pay gap would be. Furthermore, as the public we need to realise that true equality lies in winning day to day barriers to women advancement as opposed to this false belief that installing a woman leader will miraculously remove these. Mondli Zondo is a regular contributor and a Mandela Washington Fellow. He writes in his personal capacity.